I was out of the house yesterday morning at 6.15, and did a 2.5 mile round trip walking to the baths, and 20 lengths of the pool. Then, at lunch time, we went and delivered the purple bike to its new home, stopping at B&Q to buy a new terracotta pot for Jane’s triffid, and imdulging ourselves in a truly naughty bacon, egg and mushroom bap from the van in the car park. So why I felt a bit restless after supper, I have no idea, but I did, so I suggested to Pete that we went for a walk. It was a beautiful evening, and we did about 4 miles, along the old railway line to Anlaby Road, then back through West Park, stopping for a gin and tonic at Pave on Princes Ave; this bar is about 5 minutes from the house, and we’ve never been in it! And while they did a very acceptable Bombay Sapphire with lime(! ), at £6.30 for that and a pint, I’m not sure we’ll be doing it again either 🙂 But it was nice to sit outside, watching the world go by. Home then for a nice cup of tea and a netbook catchup before bed. Made a really nice change. I took this morning’s daily constitutional (3.21 miles, starting at 6.15 a.m., thanks for asking) accompanied by two Desert Island Discs podcasts – Fay Weldon, and about half of Rob Brydon, so the remainder of the latter is a treat waiting for next time. I was fascinated to hear Ms Weldon say that one of her best ever moments was sitting *on the stage* at a Grateful Dead concert; apparently they invited her to do so, although I don’t think she said why. Fascinating woman. I came home through the cemetery – I don’t know when they unlock the gates, but they were not open the other day at 6.15, and were today at about 6.55. Lots of birds singing, and squirrels running about, including some baby ones. 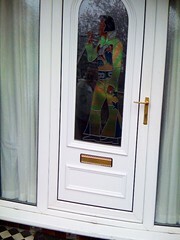 Out leafleting this morning in Bricknell ward, I spotted this tasteful door. I delivered Bricknell Ave, Fairfax Ave and Southfield Road, walking 5.74 miles according to Runkeeper, but probably nearer 7.5 when you take all the driveways into consideration. Got home, and grabbed a cup of tea while the chilli from the freezer finished thawing and the rice cooked. Carried on with some more of the Ecclestone Doctor Who, which we are working through on DVD. Then over to the church on the corner of Cottingham Road/Chanterlands Avenue for a local hustings – I was quite pleased to skewer the Labour candidate, who was rabbiting on about a referendum about PR; I asked if it would be like the EU referendum which we were promised, and never got. That was another 3.2 miles, so probably almost 11 miles walked today! Now another cup of tea, finish the episode of the Doctor, and bed. We had some serious snow overnight, and it kept on coming down, so at 7.50 we donned walking boots, warm jackets and silly hats (and a stout stick, in my case) and set off for a walk. We don’t often see this sort of weather in Long Ashton (BS41). We went round Dawsons Walk, about – oh, 3/4 mile, I suppose, through the woods. 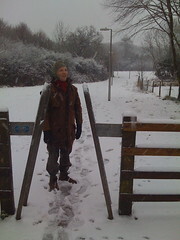 It was lovely, although the snow was coming down sideways across the level ground before the wood. We stopped at the baker on the way back for a hot pasty, which was a very good idea. Ron thought so to, and so had to be fought off.